Artist: What are you doing? 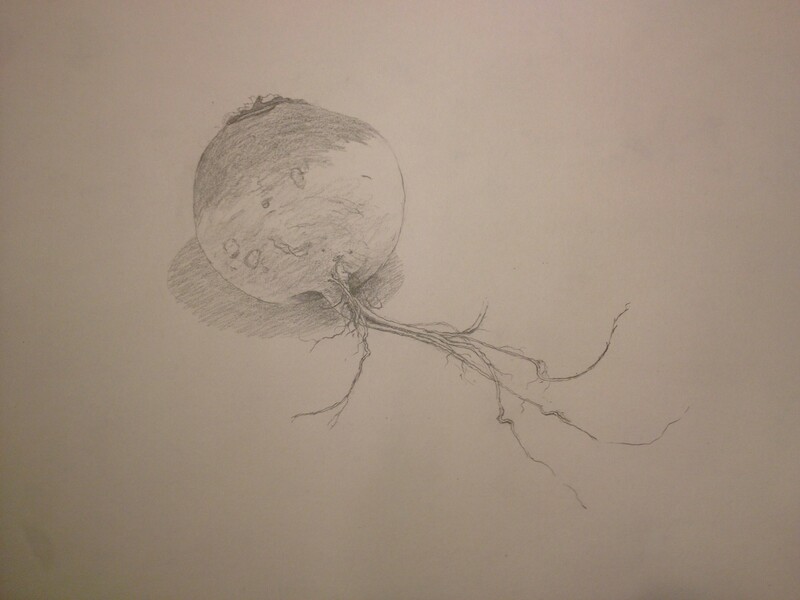 Which goes to show you don’t need to wait for inspiration to show up in order to start drawing – you just need a couple of vegetables. Seeing the two drawings, though, made me think of how easy it is to take a photograph and how hard it is to capture the essence of a thing. Somehow, artwork created by hand still has a fundamentally different feel to it than a photograph in terms of the way it captures the subject matter at hand. I hasten to add that taking a good photograph isn’t easy at all and taking an exceptional image – well, one can wait a lifetime and still not capture the ultimate shot. But taking the time to sit down and craft by hand the likeness of something – that is, I think, a skill that we shouldn’t forget about or dismiss just because it has become so easy to capture visual data. I can’t put my finger on it, but there is some quality inherent in these sketches that is lacking in my photos posted yesterday. Running my photos through any number of tricky filters isn’t going to help. I feel very fortunate to live with an artist who has a studio full of brushes and paints and pencils and pens with nibs and bottles of ink… It never ceases to amaze me how Dad and I see and interpret the world differently, even when we are both looking at exactly the same thing. 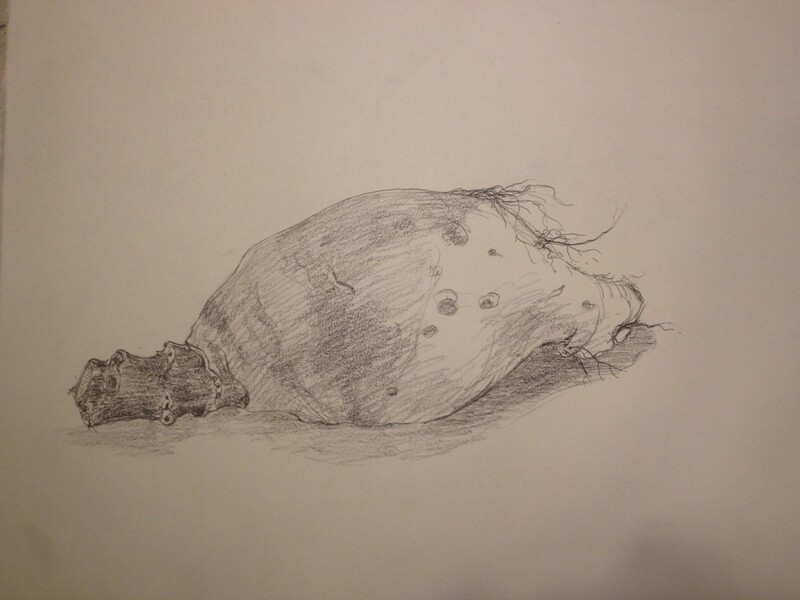 This entry was posted in Art, Blog, Photography, Uncategorized and tagged Art, drawing, e. colin williams, NaBloPoMo, photography, root vegetables, rutabaga, turnip. Bookmark the permalink. Beautiful drawings! I agree that drawings add that something extra which photos do not capture. Very nice….. My human draws too.. That is, when she thinks I won’t come lay down and nap on her drawings…. Your dad seems like an interesting person. And, the apple didn’t fall far from his tree. Lucky man, he is. I love the contrasts (and comparisons!) here. Your arts complement one another. About a year ago, I peeled apart one of my Grandfather’s old books and began watercoloring the illustrations. In my upbringing, defacing a book constituted the ultimate act of defiance. Salutations to an inspirational book, “Defiant Gardens”. These lithographs were originally distributed in booklets on good paper for field botanists to color and reference. The booklets were bound into volumes. Your dad’s work is beautiful. Enjoy and appreciate him! Thanks, Lynda – I do… We very much enjoy each other’s company, which is a real blessing.